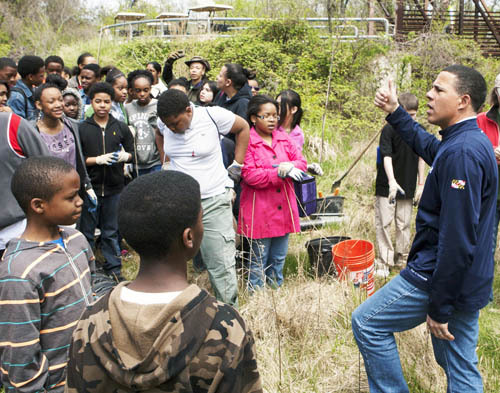 "Your Watershed, Your Backyard" (YWYB) is a science outreach education program offering Baltimore-area middle school students a comprehensive environmental curriculum. The YWYB program includes a full-day field trip to test water quality from multiple sites within the students’ local watershed, and nine class periods that include hands-on activities and a live zebrafish experiment conducted by students. Children raise zebrafish embryos in different stream samples and learn how pollution affects living organisms and the relationship between environmental conditions and the health of the watershed and the ecosystems within it. In addition to the field trip, students participate in a hands-on career day and an environmental stewardship project. In the classroom, they also learn about stormwater runoff, topography, the scientific method, model organisms, cell biology and basic animal development, invasive species, and careers in the sciences. YWYB meets the criteria for a Meaningful Watershed Educational Experience and aligns with national, state, and local science standards. 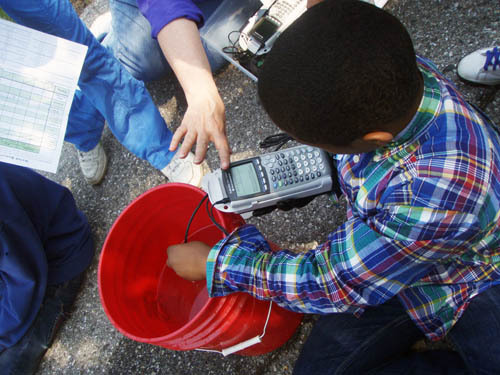 A student uses a Vernier meter to study water quality parameters. All activities aim to inspire students to participate in the protection and restoration of the Chesapeake Bay by teaching concrete actions they can take, both locally and Bay-wide, and encourage them to think of themselves as scientists and stewards of the environment. In addition, YWYB provides multi-year professional development to teachers focusing on experiential approaches to environmental and science education.